It is another drizzly day in New York. I now know what they mean by, ‘April showers before May Flowers’. Growing up in Los Angeles, I never fully understood the meaning of this phrase. Sure, it rained in April, but not that much and certainly no more than in February or March. Note to self, any phrase about weather is probably not referring to Southern California, where I am now convinced we have some of the best weather in the country. Anyway, it is raining and I have just spent an hour trying to scrub grease stains and oil spills out of my chef’s coats and aprons. Since I don’t have class tonight, I put a pot of soup on the stove and am going to spend the rest of the afternoon inside, eating soup and reading Kim Severson’s Spoon Fed. I highly recommend her memoir. Especially if you, like me, have a hard time buying any novel or memoir that is not food-related. It is a great read and one I totally relate to as a California transplant in New York. The soup I’m making to keep me and my book company is a super simple French onion soup. Super simple is really a tad redundant because if you have homemade stock on hand, French onion soup should always be simple. The key is cooking your onions low and slow for a long time to get them nice and caramelized. After that, just add stock, let everything simmer away for a bit and season. If you have some crusty bread on hand, all the better. Slice it up, place a slice on each bowl of soup and cover with gruyere cheese. A quick run under the broiler and you have a beautiful bowl of restaurant quality French onion soup. If I have them all on hand I like to use brown or yellow onions, red onions and shallots, but if you only have one kind, that’s okay too. I can’t stress enough what a difference homemade stock makes in a soup like this. If you want to try your hand at it, here are the steps for veal stock. If not, use a good-quality beef stock from your grocery store. Peel the onions. Cut them in half and then into thin slices so you have a large pile of half-moon slices. Heat the oil in a medium saucepan. Sauté the onions until beginning to soften, season with a little salt and pepper, and cover the pot. The steam captured by covering the pot will help to soften the onions without using too much oil. Uncover the pot and stir occasionally. When the onions are beginning to brown, remove the lid and continue to cook until caramelized. This can take up to 30 minutes. Add the stock to the pan and bring to a simmer. Add the thyme and bay leaf and simmer gently for 20 minutes. Remove the thyme and bay leaf and adjust seasoning with salt and pepper. Preheat your broiler. Divide the soup among four serving bowls. Top with one to two slices of bread, depending on what will fit in your bowls, and sprinkle a few tablespoons of gruyere over the bread. Run under the broiler until the cheese is melted and bubbly. Take care when serving the soup as the bowls will be extremely hot from the broiler. Enjoy with a good book on a rainy day. Oh, yeah. Nothing like French onion soup with homemade veal stock. I actually ate French Onion Soup for the very first time this year! It was a left-over childhood fear of onions. It's so comforting and looks super easy to make! It's drizzly here in Montreal too...those darn April showers. The saying is true ever year. 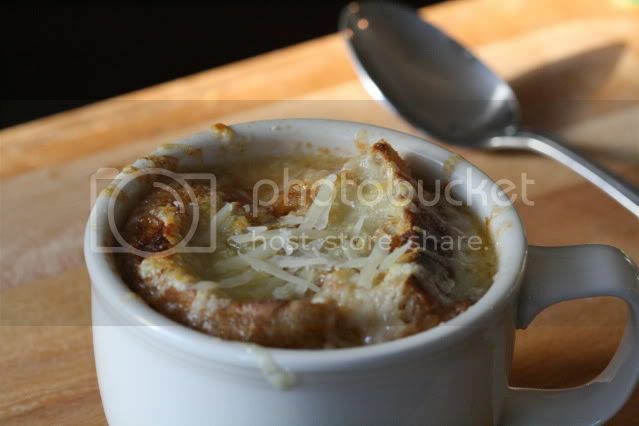 Perfect soup weather and your version of French onion soup sounds delicious! Hey there. Yes, Southern California definitely boasts the best weather in the nation (if not the world!). Read Spoon Fed and enjoyed it too. Have you read Gabrielle Hamilton's memoir? I hear it's great. This was a very interesting topic that you never hear about anymore. Or you do but people are hesitant to really dive into the core fabric of it and be upfront in detail. I couldn't agree more. The idea of a cozy day inside with a cup of this soup and book while it pours outside sounds nothing short of deliciously home-y and picturesque. Now I'm hungry. The Desperate Gardeners! Yes! Definitely try this soup with veg stock. I hope you'll use all of my recipes as a rough guide and experiment with ingredients that work best for you! Attempt to use somewhat a lot more stress to the outdoors of the sole to stop the foot from rolling inwards, also identified as pronating. MBT Shoes OutletYour physique will soon alter to this pure energetic rolling movement. Nice to see your post!